Almost two million children will receive a free lunch from Tuesday under a new £1bn scheme amid ongoing concern about its cost. 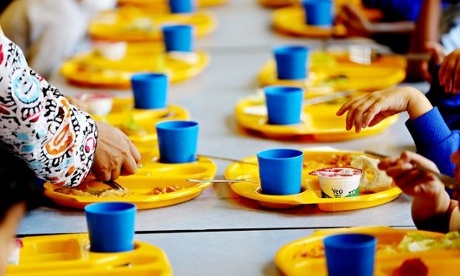 The major new initiative, first announced by Nick Clegg in 2013, will see every five to seven-year-old at England’s 16,500 primary schools eligible for free dinners. Ministers have insisted the move will save families up to £400 per year as well as having health and education benefits for youngsters. As the programme was launched Clegg vowed not to let critics “cloud” his goal of creating a level playing field for all children, adding that the scheme was “one of the most progressive changes to our school system for a long time”. His comments come a few weeks after council leaders warned they still had concerns about the scheme, claiming that local authorities and schools were being forced to raid existing budgets to ensure the scheme goes ahead. Clegg said: “This is one of most progressive changes to our school system for a long time so there’ll always be critics but that won’t cloud my goal to create a level playing field for all of our children so their success will be determined by their talents and efforts alone and not by their parents’ bank balance. The policy sparked a coalition row over the expense, though the former education secretary Michael Gove and the schools minister David Laws later wrote a joint article insisting they were both behind the scheme. Some headteachers warned the policy would cause difficulties in schools without adequate kitchen and dining facilities to feed all of their eligible pupils during the lunch hour. A poll published by the Local Government Association (LGA) suggested that just weeks before the initiative started some local authorities were facing a shortfall in the funding needed to ensure it could be delivered. Government funding worth £150m, in addition to the £1bn to cover the cost of the scheme, was handed to councils to cover the cost of bringing school kitchens and dining facilities up to scratch. The LGA’s survey of 75 councils found that 47% said they had not received enough money from the Department for Education (DfE) to cover the full cost of the work they needed to do to ensure that schools in their area were ready to provide universal free meals for infants. The shortfall across those councils that responded totalled around £25.9m, the association estimated. In a speech in July, Laws insisted there were very few schools not ready for the move.